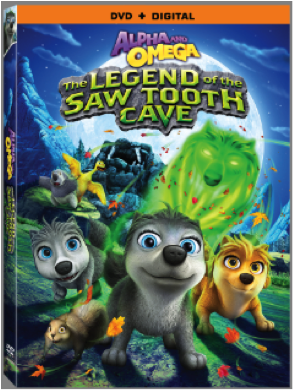 Join the pups on a journey filled with surprises just in time for Halloween as everyone’s favorite wolf pack is back in Alpha and Omega: The Legend of the Saw Tooth Cave, arriving on DVD (plus Digital) exclusively at Walmart, plus Digital HD, Video on Demand and Pay-Per-View September 23 from Lionsgate Home Entertainment. After three wildly successful Alpha And Omega releases, with over 1.5 million DVDs sold to date, the Alpha pack sets out on a ghoulish adventure in this exciting fourth chapter. Title of Copyright: Alpha and Omega: The Legend of the Saw Tooth Cave © 2014 Roop Bdr Productions, Inc. All Rights Reserved. Artwork & Supplementary Materials © 2014 Lions Gate Entertainment Inc. All Rights Reserved.